I remember bringing a three year old Bill and friend back home from nursery for a play date. 'Bill' says friend, 'When we get to your house shall we play 'punching each other in the stomachs' again?' 'Yeah let's.' says Bill. I knew having two children would involve a lot of refereeing. I wasn't prepared for quite how literal that refereeing would be at times. 'Bill, please don't eye gouge.' 'Eddie you can sit on his shoulder, but not his neck' 'NO WILLY GRABBING.'. It's like having a pair of carpet dwelling writhing otters in your front room when you're trying to watch the news unmolested. They'll wrestle for rights over everything from the last crisp to who gets to sleep with Scary Olympic Mascot Wenlock . Bill wins of course; the genetically unfair older sibling height/weight advantage- 'MUM!- TELL BILL NOT TO' echoes round the house about every 10 minutes. Eddie does have one secret weapon he can use- the power of a proffered kiss will send his brother screaming and cowering to the furthest corner of the house. Ha. So last night, for some reason I chose to blatantly encourage these habits by taking them to the finals of the Olympic Greco-Roman Wrestling; a cracking night of fun for all the family (featuring rather a lot of men's bottoms in leotards on all fours for female interest). They didn't even make it to the end of the evening before trying out new moves in their seats, meaning by the end of the evening Eddie was sitting on my lap recovering from his first fight injury with the help of a biscuit the size of his head. 'Bill!' 'sorry'. tsk. 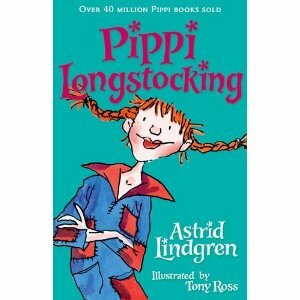 If Eddie is in need of some literary inspiration in how he might best his brother than I fail to see how he could do better than Astrid Lindgren's 'Pippi Longstocking'. Actually we saw a Swede win a bronze medal last night. Maybe he too was a younger sibling who liked to read Lindgren?